“The Jetsons” cartoon, which aired on television in the early 1960s (and again with new episodes in the 1980s) featured a family in the year 2062 riding around in a flying car. While we don’t have flying cars yet, we are soon going to hear similar sounds from the electrified vehicles (EVs) around us. A hybrid electric vehicle (HEV) uses a combination of electric motors and a standard internal combustion engine. A plug-in hybrid electric vehicle is a variant of the HEV. It still has a standard internal combustion engine and electric motors, but the internal battery can be recharged by plugging it into an external source of electric power. A battery electric vehicle is a motorized vehicle that solely uses electric motors for propulsion. It’s well-known that EVs produce very little engine noise compared to traditional internal combustion engines, thereby posing a risk for the blind, small children, the elderly, runners, cyclists or any pedestrians who need to hear that a vehicle is approaching. One study shows that these quieter EVs are 40% more likely to collide with pedestrians than cars with a regular combustion engine. Another study indicated that a pedestrian may not adequately hear EVs traveling at slow speeds until they are just 1-2 seconds away from impact – often too late to avoid harm. Several factors contribute to the reason why EVs are quieter: They make no noise when starting up, and they make no appreciable noise taking off from a stop sign or stoplight or when driving in reverse. I can confirm this experience, since I recently went shopping for a new family car. On an HEV, for instance, you simply push a button to start the car, but you don’t hear the familiar sound of the starter cranking over to start the combustion engine. You just get a green indicator light that says “ready.” You have to get used to how quiet the car is, since there is no familiar engine sound. Once you start driving, you begin to realize that whether you’re going in reverse or moving forward, you still don’t hear the combustion engine start up until you hit approximately 20 mph. In addition, the car shuts off the combustion engine automatically at some stopping points to conserve fuel. This means that when you start taking off again from a stop sign or traffic light, the vehicle is completely silent until it reaches an appropriate speed, at which point tire and wind noise can become significant. 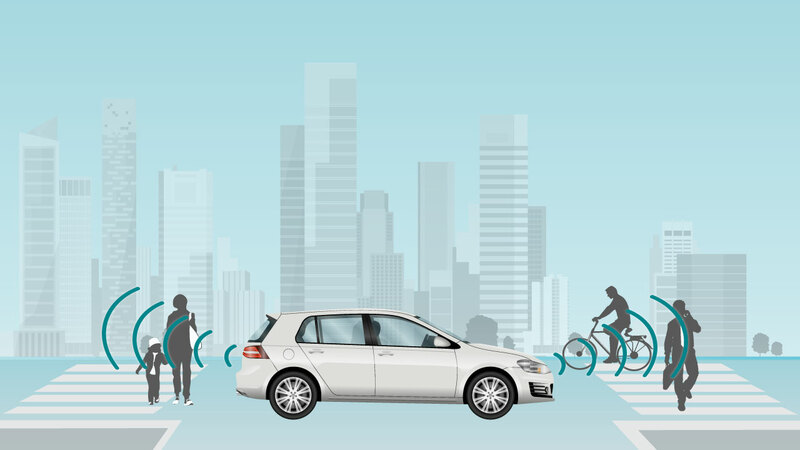 It’s precisely for these reasons that governments are starting to mandate the installation of devices on EVs that will emit an external sound when traveling at low speeds to alert pedestrians to the car’s proximity and help avert potential accidents; see Figure 1. Depending on the region of the world, these devices are called virtual engine sound systems (VESS), acoustic vehicle alerting systems (AVAS) or engine/vehicle sound generators. See our VESS integrated circuits and reference designs. The new governmental requirements generally stipulate that a VESS must emit sound when the EV is operating in reverse and while the vehicle is in forward motion up to a maximum defined speed (in the U.S., 30 kph; in Europe, 20 kph). The sound pressure level of the emitted sound must vary by a specified amount as the vehicle’s speed increases or decreases in order to alert pedestrians to its changing speed. VESS regulations typically do not mandate the exact type of tone/signal that needs to be emitted, but some of the early prototypes vary the tone/pitch to give the acoustic impression of an approaching spaceship – hence my reference to “The Jetsons.” Current implementations seem to be targeting tones that are somewhat futuristic sounding, but also harmonious, as you can hear in Figure 2. In some cases, car manufacturers are also choosing to implement an additional speaker in their VESS implementation at the rear of the car, to provide an additional safety measure by adding an extra tone to signal that the car is reversing and to allow for a more aesthetically pleasing/natural sound impression around the entire vehicle. The sound may even taper off toward the rear of the vehicle if the design only implements a front speaker. Because VESS regulations are still evolving globally, automotive audio amplifier manufacturers are rapidly moving to assure that their amplifier portfolios will support this newly emerging automotive end-equipment market space. Many car manufacturers are looking for a scalable automotive audio amplifier solution that can allow them to achieve lower R&D costs by simply building one board design to satisfy either front-speaker-only VESS designs or implementations requiring both front and rear VESS speakers. Texas Instruments (TI) offers a scalable family of Class-D automotive audio amplifiers that meets VESS market demands. TI is the only automotive audio amplifier manufacturer to offer a two-channel, digital input, Class-D automotive qualified amplifier – the TAS6422-Q1. TI also offers compatible one- and four-channel Class-D automotive audio amplifiers that provide the scalability and flexibility car manufacturers need to address the VESS market. Watch this video about the features and benefits of the TAS6424-Q1. Check out the VESS end-equipment reference diagram. See more resources for designing HEV and EVs.